On May 25, 1977, the world was introduced to a movie unlike anything it had ever seen before. Sure, there were similar themes out there – some in cinema, and some not – but we had never seen them put together in this way. When you look at a hit film today, you see it stay at the top of the box office for two to three weeks, you don't see it stay up there for months. Star Wars (and let's just go with that as there was no "Episode IV" back then), was a true phenomenon. It changed how films were viewed and the scope of what they could achieve. It caused endless lines at the theaters, and it ran for months on end. But I didn't get a chance to see it until September 1977. I turned six-years-old on July 20, 1977. I was aware of Star Wars. Being that age, I had to wait for my folks to take me to see it. They kept telling me we would when the line died down, but that just wasn't happening. And that is something I need to explain. When you drive up to a theater in 2017, you more than likely have your ticket on your phone. You have an assigned seat in some locations. You have 21 screens, and if the film you're seeing is big enough, it's probably playing on several of them at once. In 1977, if you found a theater with more than one screen, you kind of stared at it in bewilderment. My parents finally decided in September that it was finally time, assuming that after four months theaters would no longer be busy. We trudged out to a theater early one evening to see the film. Now, I don't remember the exact time of each showing, but by the time we got there we couldn't get a ticket for anything earlier than the midnight screening. I'm sure you're saying to yourself, "Didn't you just say you were six?" Yes, I was six, but I was already a night owl. We opted to stay in the parking lot for over four hours as there were so many people standing in line for the various showings. My father volunteered to hold our place while my mom entertained me. After window shopping the strip mall, my father went into the theater for us and bought a program book (yes, they still did that in 1977) so I had something to look at. My mom and I sat on a curb across from the theater, and I started flipping through the book. I was transfixed. I remember seeing a picture of Han and Chewie and being immediately mesmerized. And I distinctly remember the picture of Leia you see above. The hair. The gun. The way she was peeking around the corner. I had to know what was happening. Even from still photos, I knew Star Wars was different and special, and that blasted book actually made the wait for our midnight showing that much worse. On March 14, 1999, That '70s Show ran an episode entitled "A New Hope." In the story, Eric, Hyde, Fez and Kelso go see Star Wars, and they become obsessed. At the tail end of that scene, you see Kelso's face. A white light flashes, and he goes, "Whoa." It isn't until later in the episode when Red goes to see it and you realize that flash of light signifies the moment the person "got" the movie. On that night in September 1977, to hear my mother tell the story, there was no flash of light. But the moment the logo appeared and the music started, she looked over at my father and I, and our jaws were agape, and they did not leave that position until the film ended around 2 a.m.
What followed was days and weeks of me flipping through that program until the cover finally fell off. I was obsessed. And unlike today, there wasn't an internet to learn more. There wasn't endless amounts of merchandise to purchase. There was no impending home video release to look forward to. There were trips to the theater and absolutely nothing else. The only thing that was out there at that time was the original run of the Marvel Comics series, which I immediately started buying. But something unusual happened by that Christmas. Something that was unheard of. And something that was, to be blunt, illegal. To this day I don't know how my paternal uncle did it, and I really don't care to know. By Christmas 1977, there wasn't a family member who didn't know of my growing Star Wars obsession. Maybe it was the fact I had my mother make me a Han Solo costume for Halloween and my father make me a wooden blaster. Maybe it was the fact I talked about absolutely nothing else at any time. One day my dad came home from work and he said he had a surprise for me. He carried in a Betamax machine that was the size of a compact car, and two Betamax cassettes. He wouldn't tell me what was on them, but that I just needed to wait while he hooked it up. Once he did, he put in the first tape, and after a moment I saw blue text that said, "A long time ago in a galaxy far, far away…" and it was followed by that music and the opening crawl. In 1977 I have absolutely no clue how my uncle had found a way to pirate a movie to Betamax tapes, but he had done it. What followed was – and I am not exaggerating here, and I have no clue how they survived that long – was 484 viewings of the original Star Wars. You'll notice I keep referring to "tapes" as opposed to "tape," and there is a reason for that. Betamax tapes were notoriously short. So the solution was that the film was split onto two tapes. Whenever I got the end of the training ball scene on the Falcon pictured above, that was when I had to get up and swap the tapes to watch the second half of the movie. To this day I still feel the urge to stand up when I get to the end of that scene. Thanks to those tapes, however, my obsession with Star Wars only grew worse. It became a game in my house to make me sit with my back to the TV and see if I could act out the physical motions happening on screen. When the movie wasn't playing my parents liked to throw a line at me and see how many lines I could do from memory from that point forward. Let's be honest, I was dominating the television time in my house with this film, so the least I could be was their trained monkey. I lived on a cul de sac in Glendale, Arizona. For such a small street we had two kids named Scott, so naturally, we called one Big Scott and one Little Scott. One evening I was out in the driveway with my parents washing our '67 Malibu when I see Little Scott and his mom coming down the street. The moment they pulled in the driveway, and before his mom had time to turn off the car, Little Scott was bolting towards me waving something in the air and screaming, "SEAN! SEAN! GEMCO HAS STAR WARS TOYS!" He reached me and handed me his just-purchased C-3P0. I turned to my parents and said, "We have to go to Gemco!" "Not until we're done washing the car." Never has a six-year-old helped wash a car faster. As soon as we were done, they took me to Gemco. I ran to the toy area to find a floor display of Star Wars figures surrounded by befuddled adults. You have to remember, at this time no one was used to the concept of action figures that were only 3.75-inches tall. This was new and unusual for them. I quickly grabbed one of each on display. Now, this is where my memory does fog a bit. I remember I grabbed nine, and I know for sure one of the missing ones was the Jawa as the hunt for him turned into its own saga. For the life of me, though, I cannot remember what the other two missing ones were. I was allowed to only open one that night, so I chose Han Solo. What followed was, well, embarrassing. My parents said I would have to earn opening the other eight, but they never said I couldn't stare at them. Nor did they say I couldn't take these eight unopened figures with me absolutely everywhere I went. That's right folks, for months I carried around a bag of unopened Star Wars action figures. As you can imagine, what followed was years of merchandise buying. We left Glendale in June 1979 for Missouri, and the very first thing we did to my bedroom was to put up Star Wars wallpaper. It was the least they could do for me since I had to give my uncle back his Betamax and those tapes since he had 'loaned' them to us (sorry, Dell). I will never hear of Star Wars ever again and not immediately think of you. As I already said, I'm not proud. 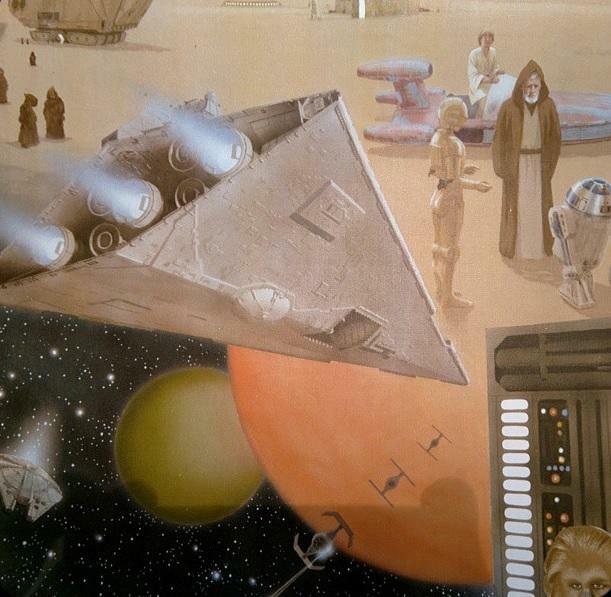 Just a small taste of my sweet, sweet Star Wars wallpaper from 1979. Here we sit, 40 years to the day since Star Wars entered the zeitgeist, and while I can honestly say I'm not as obsessed as I was in the 1970s, there still isn't a day that I don't think about it. While I know I watched those tapes 484 times, I don't know my current total for the original film. If I was to hazard a guess, I'm well over 1,000, but I can't say for sure. And I certainly wouldn't want to even try to guess at how much money I've spent over the years on merchandise; I just know it is way too much. But, this is where I get to the point of all this. This is where all of this endless chattering leads, and that is to say: I know I would not be the same person I am today without Star Wars. I more than likely would not have opened a comic book store in 1986, something that dominated my life for two decades. I wouldn't have become obsessed with toys and the minutia of what goes into making them. That led to me being considered an expert on action figures in the mid-1990s and writing and/or editing nearly every collectible price guides published around that time. And I certainly can point to Star Wars for kindling my fascination with technology. Seeing Star Wars on that night in September 1977 showed me a futuristic world of laser swords, floating cars and guns that fired light. It made me wonder what other life could be out there in the stars. It made me want more from technology. At that time the height of technology to me was my Spirit of 76 transistor radio I listened to every night before bed, and now I wanted a land speeder. I have seen thousands of movies in my life, from classics to z-grade garbage, and nothing has ever spoken to me the way Star Wars did. Heck, not even the other seven films in the saga have impacted me so much. I have seen and love all of them (alright, maybe I don't 'love' The Phantom Menace, but you get my point), but none of them could ever be that first film again. Certainly, I am not alone in how this movie impacted me, but can you really point at any other movie in history that changed things the way Star Wars did? Yes, other movies have made more money to be sure, but I am talking a true game changer. A movie that launched a literal empire and not just a figurative one. You would be hard pressed to convince me. So, on this 40th anniversary, all of this is just my way of wanting to thank George Lucas for his original vision. There is at least one little kid in 1977 that you had a profound effect on. … and sorry about that pirated copy. The statute of limitations has run out, right?